Students from the University of Plymouth’s Institute of Education have again benefitted from bursaries from the Nancy Langhorne Astor Scholarships Trust. The trust was set up after Lady Astor, the first woman to sit as a Member of Parliament in the House of Commons, died in 1964. It has been used to support the aspirations of Plymouth citizens in higher education ever since. 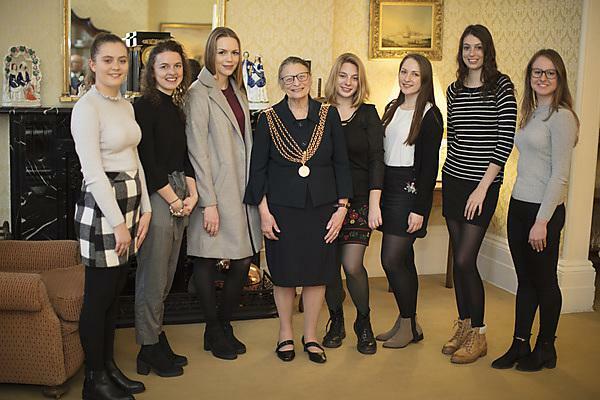 Last night (Thursday 15 March 2018) some of the 18 students who received bursaries this year attended a presentation event at 3 Elliott Terrace, a former home of the Astor family. They were presented with certificates by the Lord Mayor of Plymouth, Cllr Wendy Foster, and talked about their experiences with trustees and fellow students. Each applicant had to demonstrate a determination to enhance their personal and professional development and, following in the footsteps of Nancy Astor, demonstrate a determination to make a difference to the lives of young children. Some of the projects and activities funded by bursaries this year included volunteering with young children in the Gambia, Costa Rica and the Czech Republic as well as undertaking research at a kindergarten in Spain and attending Makaton – a language programme using signs, symbols and speech - and paediatric first aid training. The Nancy Langhorne Astor Scholarships Trust is providing generous financial support for students each academic year relating to their interests in the care and education of young children (0 - 8 years). Successful applications in previous years have funded Makaton Training, First Aid Training, Forest School Training, Introductory Courses in Play Therapy and Forest School Leadership as well as study trips and certain costs associated with research activity.